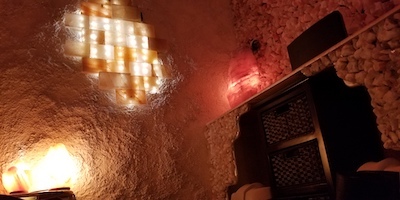 Wondering how to find the best salt rooms near you? Are you aware of the benefits? Want to know how they work? Most people have heard about spas, ands they love them! They are a great place to relax and revitalize the body and mind. But what other benefits can they provide? A newer trend increasingly found at more modern spas is something called halotherapy, or salt therapy. This allows for breathable salt particles intended to improve one’s breathing. While this might sounds new to you, it’s actually not. In fact, salt therapy isn't new at all. Back in the eighteen hundreds, a Polish physician by the name of Feliks Boczkowski discovered that salt mine workers did not experience respiratory issues or lung disease compared to other miners. Nearly a hundred years later, a German named Karl Hermann Spannagel noticed that his patients' health actually improved after hiding out in some salt caves, while avoiding heavy bombing during WWII. As the news of the benefits of salt therapy spread across Eastern Europe, so did creation of many of these facilities - places you can sit back, relax and breathe in the salty air while in a room made entirely out of giant slabs of Himalayan sea salt. It’s actually quite simple. In Salt therapy, there are no special clothes, heavy breathing apparatus or needles needed. There is also nothing to ingest and no invasive procedures. With dry salt aerosol therapy, you just sit on a chair and relax as the micro-particles are inhaled. Typical sessions that last between 20 and 45 minutes. In that time, particles penetrate deep into the lungs, bronchi, bronchioles and alveoli. The reason it seems to work well for the respiratory tract and lungs is that dry salt is super absorbent and attract pollutants and allergens throughout the person’s respiratory tract. The dry salt can then stimulate the body’s internal processes for cleansing the respiratory system, removing the build-up of foreign particles that cause various respiratory ailments. Are all Salt Rooms the same? No. It is recommended for the best results to find a facility that uses 100% pharmaceutical grade sodium chloride (salt), which is heated evaporating all moisture and therefore maximizing the salt’s bactericide, mucokinetic, hydrophilic and anti-inflammatory properties. I addition, heat removes all moisture so when the salt is crushed and grinded into tiny micro-particles and then inhaled, the therapeutic benefits are more effective and able to reach the entire respiratory tract. Some salt room facilities even use specific therapeutic parameters, such as salt particle concentration, size, and speed of aerosol. They tailor these to a client’s individual wellness goals using state-of-the-art equipment. These therapeutic parameters are preset, and then controlled and maintained exuding a low concentration of aerosol salt into the therapy room. Does Salt Therapy help the skin? It is thought that the tiny micro-particles of salt due influence the skin’s protective layer and hairs, providing healing and aesthetic (cosmetic) benefits. This occurs by increasing the activity of skin cell ion channels. Specifically, the micro-particles of salt trigger skin microcirculation and cellular membrane activity which can help in enhancing the overall health of the skin. So how does halotherapy, or salt therapy work? Well, many in the scientific community isn't aren't sure yet. There are a number of theories, such as that the tiny salt particles being inhaled kill off microorganisms in the lungs to reducing inflammation or perhaps that it helps in decreasing mucus, or a mixture of both of these hypothesis. Dr. Norman Edelman, Senior Scientific Advisor to the American Lung Association, has suggested that potentially, it could be more than just a placebo effect and suggests that it's possible that salt therapy offers relief to people with obstructive lung disease such as asthma or COPD cough sputum (a thick mixture of saliva and mucus. According to Dr. Edelman, "when fine salt particles are inhaled, they will fall on the airway linings and draw water into the airway, thinning the mucous and making it easier to raise, thus making people feel better." So if you want to find the best salt rooms nearby or are curious to the benefits or how they work, you now have a better understanding. They appear to assist in helping to cleanse lungs, strengthen respiratory function, improve the health of skin and achieve natural symptom relief. Of course, you should always consult your personal doctor prior to changing any of your health-related habits.